Gatlinburg Attractions: Celebrate Spring with the Wildflower Pilgrimage in Gatlinburg - Bear Camp Cabin Rentals. Spring has sprung in the Smokies, and there is no better way to celebrate the season than the annual Spring Wildflower Pilgrimage! Now in its 64th year, this beloved Gatlinburg event features guided tours of the Great Smoky Mountains National Park and a collection of fantastic workshops about the area’s wildlife and natural history. The Wildflower Pilgrimage will last from Tuesday April 15 – Saturday April 19. The outdoor events take place all over the national park, and the indoor workshops and lectures will be at the Sugarlands Training Room and the Mills Conference Center. With 146 different walks and workshops, there is no shortage of things to do at the Wildflower Pilgrimage! 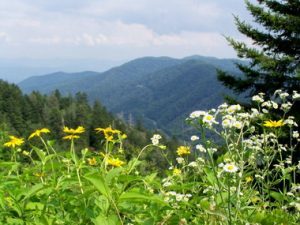 As you probably guessed, there are plenty of hikes that will take guests to some of the best wildflower viewing spots in the Smokies, including Baskins Creek Trail, the Noah “Bud” Ogle Trail, and the Chestnut Top Trail. Aspiring artists should consider taking some of the excellent drawing and photography classes offered as part of the Wildflower Pilgrimage. Many of the workshops take guests out into the national park so they can capture the natural beauty of the area on canvas or on film. In addition to the wildflower hikes and artistic workshops mentioned above, you’ll have the chance to learn about bird watching, tree and plant identification, Native American traditions, and so much more! Registration is currently available online on the Wildflower Pilgrimage website, or you can register in person starting on April 15. The walks and workshops fill up fast, so it’s better to sign up sooner rather than later! For adults, registration is $50 for one day or $75 for two or more days. Children 11 years old or younger get in free with a registered adult. Students who bring a valid ID can register for the entire week for only $15. Bear Camp Cabins is just minutes away from this awesome Gatlinburg event! With fully furnished kitchens, bubbly hot tubs, and wireless internet, our Smoky Mountain cabins have everything you need for an unforgettable vacation. Before you book, take a look at our Specials page to learn how you can get a free night at Bear Camp, or give us a call at 1-800-705-6346.